Ho-Chunk, Inc. and the Winnebago Tribe of Nebraska received two of only 13 national awards from the DOE. The funding includes $395,000 in grants from the Office of Indian Energy at the Department of Energy and $395,000 in matching funds from tribal sources, including Ho-Chunk, Inc. Currently, Ho-Chunk, Inc. is working with Nebraska Renewable Energy Systems for these multiple projects. They’ve installed 1,000 solar panels at 14 sites across the Winnebago Reservation that will generate over 300 kilowatts of solar power, effectively reducing energy bills by about $40,000 a year. These projects will offset 25 to 75% of total energy usage at the sites. Solar installation sites include the Tribal Pow Wow Grounds, Winnebago Senior Center, the Senior Housing Complex in Ho-Chunk Village, and the solar panel farm on the north end of the community. The project also includes wind turbine replacement for Little Priest Tribal College. 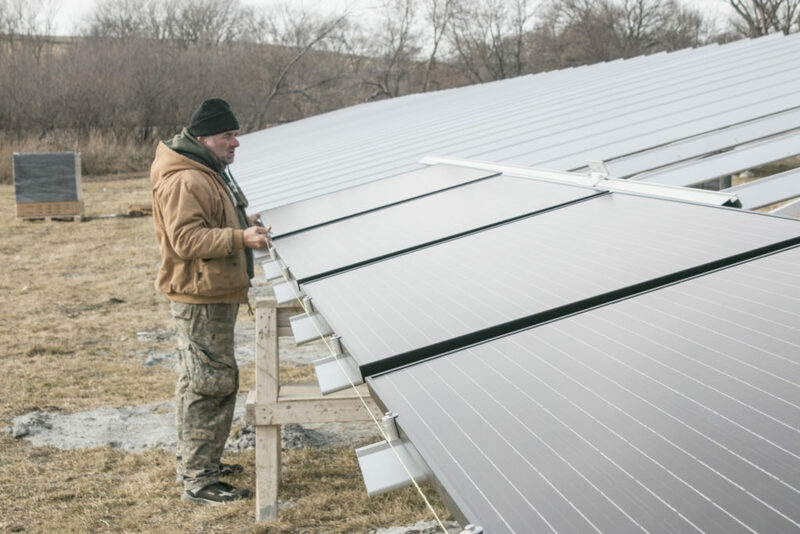 Images Courtesy of Sam Burrish: Robert Byrnes, owner of Nebraska Renewable Energy Systems (top photo) and the Winnebago Tribe’s Solar Panel Farm on the north end of the community, with one of Byrnes’ crew members working on it. The Winnebago Community and Renewable Energy Systems are planning a ribbon cutting ceremony later on this spring. Details will be announced in Nebraskans for Solar’s newsletter and posted on our calendar, NewsBlog and Facebook Page. Robert Byrnes, owner of Nebraska Renewable Energy Systems, is coordinating with the Winnebago Community to host a requested August tour for Nebraskans for Solar’ and Nebraska Solar Schools’ ListServe members. Watch our calendar and newsletters for more information. This entry was posted in Nebraska / Midwest News and tagged Ho-Chunk Inc, Nebraska Renewable Energy Systems, renewable energy and economic development, Robert Byrnes - Nebraska Renewable Energy Systems, Sam Burrish - Ho-Chunk Inc's Communications Manager, sovereignty, The Winnebago Tribe of Nebraska on March 23, 2018 by Helen Deffenbacher.